In some recent interviews, Simon Kuper has suggested that Liverpool established a data-driven style of play focussed around crossing last season. He theorised that Liverpool attempted to cater to Andy Carroll’s heading strengths by buying players with good crossing statistics, such as Stewart Downing and Jordan Henderson. Kuper then goes on to state that such an approach is flawed due to crossing being an inefficient means of scoring goals. Earlier in the season, the Guardian’s Secret Footballer also suggested that statistical principles guided Damien Comolli towards a crossing focussed approach in the transfer market. Andrew Beasley conducted an excellent analysis for The Tomkins Times on whether the data indicated that such an approach (along with some others) was actually working. So the question is: Did Liverpool really pursue a strategy based around crossing last season and to what extent was it successful (you can probably guess the answer to the second part)? A pass from a wide position into a specific area in front of the goal. The basic numbers show that Liverpool attempted more crosses (1102) than any other team in the Premier League last season. Manchester United (1018) and Wolves (999) ranked second and third respectively. At the other end of the scale, Blackburn (610), Fulham (649) and Swansea (721) attempted the fewest. The average per team was 837.2 crosses attempted, which equates to just over 22 crosses per game. While the raw numbers provide a guide, it is possible that the figures could be skewed by how much of the ball a particular team has on average. For example, Wolves had much less of the ball than Manchester United last season but attempted a similar number of crosses. This suggests that Wolves were keener to attempt crosses than Manchester United. Furthermore, set-plays should be isolated from the total crosses, as teams may have different approaches in open-play vs set-play. In order to account for this, I’ve calculated the ratio of attacking half passes to total open-play crosses in the graph below. This gives an indication of how keen a team is to attempt a cross during open-play. I limited the passing to the attacking half only as this is where most (if not all) crosses will originate from and it avoids the data being skewed by teams that play a lot of passes in their own half. Similarly to this tweet by OptaJoe, I calculated the average number of open-play crosses that each team in the Premier League required to score a goal from an open-play cross last season. 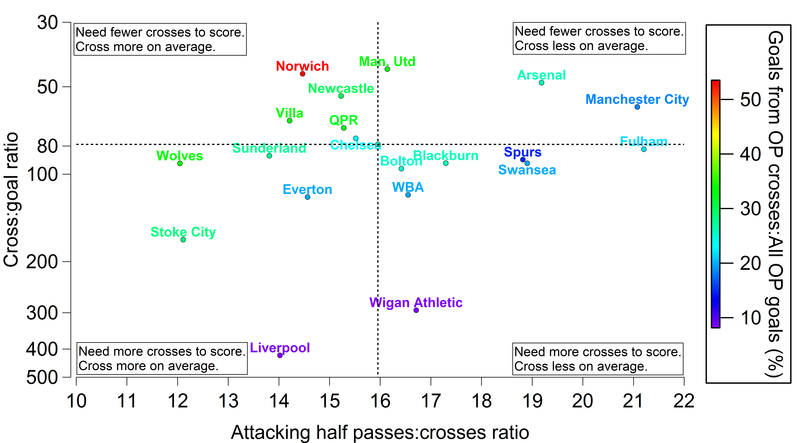 This is shown in the graph below versus the number of attacking half passes per open-play cross. Relationship between the number of crosses in open-play required to score a goal from a cross in open-play and the number of passes in the attacking half by a team prior to an open-play cross for English Premier League teams in 2011/12. Note that the cross:goal ratio scale is logarithmic and that it is reversed as a larger number is worse. The horizontal dashed black line indicates the average number of open-play crosses required to score a goal from a cross in open-play across the league, while the vertical dashed black line indicates the average number of passes in the attacking half by a team prior to an open-play cross. The teams are coloured by the percentage amount of goals they scored from open-play crosses, relative to their total number of goals in open-play. Data is provided by Opta, WhoScored and EPL-Index. The analysis indicates that Liverpool did indeed pursue a crossing strategy last season relative to their peers in the Premier League, as they attempted 14 passes in the attacking half prior to attempting a cross. Only Wolves, Stoke and Sunderland played fewer attacking half passes prior to attempting a cross last season. At the other end of the scale, Manchester City and Fulham were relatively sheepish when it came to crossing, attempting just over 21 passes in their opponent’s half prior to attempting a cross. Arsenal, Swansea and Spurs also stood out here, lying more than 1 standard deviation above the league average. Liverpool seemingly embarked upon a style of play that provided them with a extremely poor return in terms of goals (only 2 goals from an open-play cross all season). Is crossing the ball an inefficient means of scoring? The above analysis seemingly demonstrates that Liverpool did indeed pursue a style of play centred around crossing. Liverpool’s apparent quest to show that crossing is an extremely inefficient means of scoring last season (I’m personally still trying to forget those 46 crosses against West Brom at Anfield) potentially clouds the more general question of whether crossing is a tactic worth basing your team around. It could be that crossing can be an efficient way to score but Liverpool were just simply not very good at it. According to WhoScored, 659 goals were scored in total from open-play, while 241 goals came from set pieces (excluding penalties). The data from Opta show that 166 and 128 goals were scored from open and set-plays respectively. Thus 25% and 53% of all goals in these categories came from crosses. The average number of crosses per goal scored last season was 79 in open-play and 28.3 from a set-piece. Crossing accuracy is also higher for set-pieces (33.9%) compared with open-play (20.5%). This demonstrates that crossing is more effective from set-pieces than in open play. The above analysis demonstrates that Liverpool pursued a playing style overly focussed upon crossing, which yielded very meagre returns. Whether the poor return was a symptom or a contributing factor to their generally poor shot conversion isn’t clear at present and requires further analysis. The more general question regarding whether crossing is an efficient means of scoring is difficult to assess without more analysis. This study shows that crossing at set-pieces is more efficient than in open-play but to fully answer this question requires comparison with other modes of scoring. The above analysis suggests that structuring your team around crossing in open-play is a very low yield method of scoring, which also results in the loss of possession close to 80% of the time. Liverpool’s addiction to crossing appears to be a recent trend. In the 3 seasons prior to 2011/12, they averaged 16.4, 15.4 and 15.5 attacking half passes prior to an attempted cross. Swansea under Brendan Rodgers averaged 18.9 last season, which potentially suggests that next season Liverpool will try to kick the crossing habit. This entry was posted in Crossing, English Premier League, Liverpool, Passing, Shooting and tagged Arsenal, Aston Villa, Blackburn Rovers, Bolton Wanderers, Chelsea, Crossing, EPL, Everton, Fulham, Liverpool, Manchester City, Manchester Utd, Newcastle Utd, Norwich City, Passing, QPR, Shooting, Stoke City, Sunderland, Swansea City, Tottenham Hotspur, West Bromwich Albion, Wigan, Wolves by Will Gurpinar-Morgan. Bookmark the permalink. Does this mean we can expect Nicky Shorey at anfield soon?